When the cruise ships and tour buses leave, and the weather starts to cool, the night sky in Alaska comes alive with bands of green, and sometimes red, lights. This phenomenon is known as the aurora borealis, or the Northern Lights. 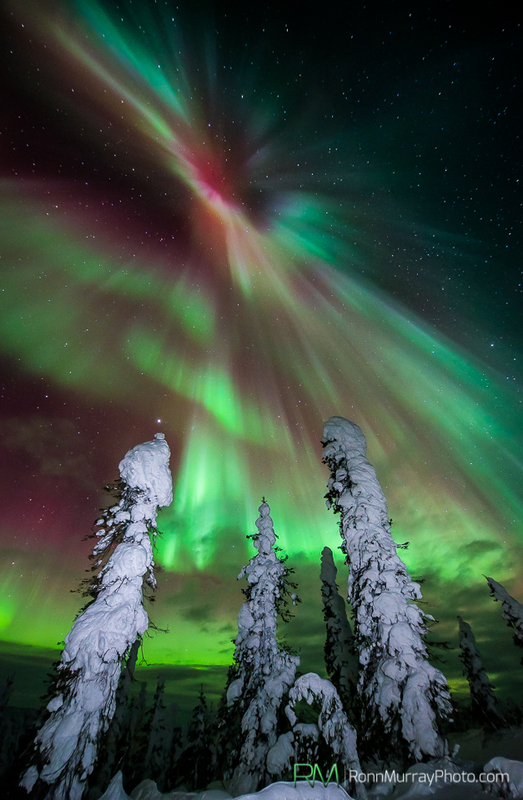 While the Northern Lights are often visible from various parts of the state, Fairbanks has the reputation for being one of the best places in the world for aurora viewing. Its far north location and nearly constant darkness in the winter months, combined with its accessibility, make it an ideal location for watching the Northern Lights. According to the Fairbanks Convention & Visitor’s Bureau, a three-night stay in Fairbanks during the winter months (October – March) gives guests an 80 percent chance of seeing the Northern Lights. Because Fairbanks offers some of the best Northern Lights viewing in the state, the University of Alaska-Fairbanks is also home to the Geophysical Institute, a facility dedicated to studying space and aurora physics, as well as earthquake seismology, glaciology, atmospheric sciences, and volcanic sciences – all of which can be studied within the state of Alaska. The aurora is caused by charged particles that are released by the sun. These particles are carried from the sun by the solar wind and get trapped in the earth’s magnetic field, known as the magnetosphere. As the particles travel along the magnetosphere, they accelerate, which causes them to bounce around the earth’s atmosphere towards the north and south poles. The charged particles pass along this energy to the atoms in earth’s atmosphere, which causes the atoms to emit light and “dance” across the sky. Researchers at the UAF Geophysical Institute also work to predict and forecast the aurora. To predict the aurora, researchers look at the sun’s solar activity two days in advance because it takes these charged particles two days to travel from the sun to the earth. They also look at the speed and density of the solar wind and storms can play a role, too. Researchers at the UAF Geophysical Institute forecast aurora activity on a scale of 0 to 9. The higher the number, the more active the aurora and the farther south it will be visible. Catching a glimpse of one of these amazing light shows requires total darkness. Sometimes even a bright moon can drown out the aurora’s intensity. The perfect spot will be away from city lights. The Northern Lights are as exciting to locals and they are to visitors, so prominent viewing areas may be crowded. If driving, it’s important to dim headlights when approaching a viewing area. It’s also important to keep the use of flashlights and cell phones to a minimum, as any kind of excess light can affect the view of the Northern Lights. Although Alaska is dark for several hours during the day in the winter, the aurora is most active between 10 p.m. and 2 a.m. Chasing the Northern Lights sometimes takes fifteen minutes, other times it can take all night to witness a good light show. In a climate like Fairbanks, where winter temperatures average between 2 and -13 degrees, it’s essential to be prepared. Dress warm, wear lots of layers and pack appropriate gear if venturing far away from populated areas. Photographing the aurora can be tricky because viewing is best in low light conditions, which can make it difficult to pick up the deep green and red lights with a camera. Although it is possible to pick up a slight glow with a cell phone, the best shot will be with something that can shoot in full manual mode. Many cameras offer this feature. This way, things like aperture, shutter speed and ISO settings can be controlled. Aperture: A camera’s aperture refers to the opening in the lens that allows light into the photo. Typically, Northern Lights photography requires a larger aperture, so the camera will need to be set to a smaller f/stop. Shutter speed: Shutter speed refers to how long it actually takes the camera’s shutter to open and close to take the picture. A slower shutter speed allows more light into the picture, without using the camera’s flash. Therefore, a slower shutter speed is required to capture the Northern Lights. ISO: ISO refers to a camera lens’s sensitivity to light. Therefore, it is necessary to use a higher ISO setting when photographing the Northern Lights. The catch, however, is that too high of an ISO setting can cause photos to appear grainy. When photographing with these particular settings, the camera will have to remain very still. Therefore a sturdy tripod is an absolute necessity when photographing the Northern Lights. Many photographers also recommend using a remote or the camera’s self-timer settings because even pressing the button to take the picture can shake the camera enough to blur the shot. Focus is also an important aspect of Northern Lights photography and also more challenging in low light conditions. 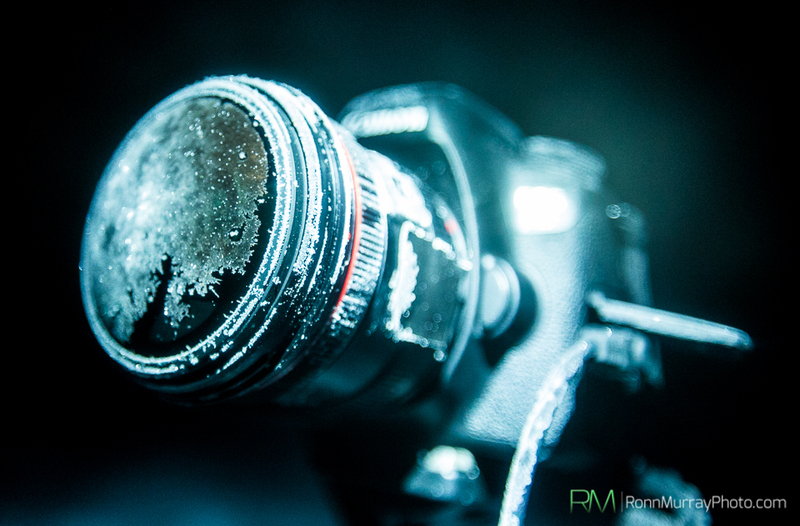 Photographer Ronn Murray of Fairbanks recommends preparing the camera’s focus before heading out for the night. “You can pre-focus in the daytime for a very distant point using the camera’s auto focus and then switch to manual focus and tape the focus ring in place,” Murray said. Murray also recommends bringing spare batteries. These settings may give you the right start, but there are no standard camera settings to guarantee a perfect shot. What works on one night may not hold true the next time. It’s a different formula each time and may take some practice before getting it perfect. Luckily for visitors and photography enthusiasts, Murray offers his own Northern Lights photography workshop tours out of Fairbanks. Tour-goers get an inside glimpse to his tips and tricks and if the weather allows, a portrait of themselves with an aurora backdrop. More information on Murray’s photo tours can be found here. And for those who just can’t wait for their trip north to catch a glimpse of the Northern Lights, Murray’s website features a live aurora webcam. Alaska Airlines offers direct flights to Fairbanks from both Seattle and Anchorage. Search for flights. 3 comments on "How to view and photograph the Northern Lights"
I’ve seen them from the air and lots of times from the ground. There is nothing on earth as amazing as the Aurora when it is highly active. If you can tough it out in the cold and get away from light pollution, they will literally mesmerize you. You’ll swear you can hear them, feel like you can touch them. It will be the show that gives you goose bumps, not the cold. It is one of my life goals to go and see the norther lights so this was a great read. Would be amazing to be able to see it from the air! Caitlin, again you captured the beauty of Alaska with this story. Winter is spectacular and visitors should not miss the opportunity to view the Northern Lights.